Apparently the groundhog was right: he came out of his den and saw his shadow, and now we are enjoying at least six more weeks of winter. This is a tradition that began in Punxsutawney, Pennsylvania in 1887. As the story goes, each year, when the groundhog (known as Punxsutawney Phil), comes out of his den on Groundhog Day, February 2, if he sees his shadow he goes back into his den and we have six more weeks of winter. He must have seen his shadow and then some this year, as we have had more than 337 inches of snowfall since Groundhog Day, including eleven more inches in just the past three days! Spring skiing is about as good as it gets! In spite of the great snow, most of the resorts are still planning on closing mid-April, with the exceptions of Squaw Valley and Mammoth Mountain. Accordingly, we are planning our End of Season Sale for May 4th, so mark your calendar. Skis, snowboards, boots, jackets, pants, and poles go on sale. This is a great opportunity to pick up some good used equipment at great prices. Like always, we will have free hot dogs and soft drinks to help you keep your energy up while you shop! We’ll see you then—and in the mean time, think snow (because you can never have too much)! https://theskirenters.com/wp-content/uploads/2019/03/header-mar30_2019-e1553798983753.jpg 429 1130 The Ski Renters /wp-content/uploads/2011/04/the-ski-renter.png The Ski Renters2019-03-29 06:00:382019-03-28 18:46:21Spring Skiing and a Sale! One of our bylines is “Think Snow!” Apparently you did, as we just got two to three feet of new snow in the Tahoe-Truckee area. That’s two to three feet of fresh powder, and there is another foot and a half on the way! Why do we love new snow? Because it is very forgiving! It softens the bumps, smooths out the ride, and is easy to make turns in. It doesn’t grab your edges. It feels like you are floating, as long as it isn’t too heavy (meaning it has too much water content). When that’s the case, or when the new powder has been down for a couple of days and starts to congeal, it resists your turns more. If you notice that, you need to focus more on carving your turns. That’s also when the groomers come out, to make it easier for you. For skiers and snowboarders, there’s nothing quite like fresh powder! Consider trying it with powder skis. They’re a little wider, to take even greater advantage of the soft stuff. We have a number of powder skis in our demo rack. They are bigger, and mostly aimed at our more advanced skiers. If you fit that description, give them a try. And whatever you do, keep thinking snow! https://theskirenters.com/wp-content/uploads/2019/01/header-jan23-2019-e1548709617595.jpg 421 1130 The Ski Renters /wp-content/uploads/2011/04/the-ski-renter.png The Ski Renters2019-01-26 06:00:422019-01-28 21:07:30Seriously Fresh Snow! It’s here! 22 inches at Kirkwood, 18 inches at Dodge Ridge, 17 inches at Bear Valley, 16 inches at Boreal, 14 inches at Squaw, 13 inches at Northstar, and 12 inches at Heavenly. Another storm is expected next week! The experts are projecting anywhere from 11 inches (low projection for Mt. Rose) to 30 inches (high projection for Dodge Ridge and Squaw). It can always change, but that’s the current forecast for the next ten days. We have 500 pairs of skis and 250 snowboards that are ready to get out on the slopes, along with almost everything else you might need to help ensure a great trip! All of our fitting technicians have just finished re-certifying for the season, so come in and let us set you up. After all, why buy when you can rent? And don’t forget to think snow! https://theskirenters.com/wp-content/uploads/2018/11/header-nov26_2018-e1543371072919.jpg 429 1130 The Ski Renters /wp-content/uploads/2011/04/the-ski-renter.png The Ski Renters2018-11-28 06:00:302018-11-28 02:11:49Snow! Ski Season May Be Closer Than You Think! Last Friday, Wolf Creek Ski Area in Southwestern Colorado opened for weekend operations. It was the resort’s second earliest opening of all time! Arapaho Basin, also in Colorado, is opening this Friday. https://theskirenters.com/wp-content/uploads/2018/10/header-oct27_2018-e1540580467273.jpg 429 1130 The Ski Renters /wp-content/uploads/2011/04/the-ski-renter.png The Ski Renters2018-10-27 06:00:492018-10-26 19:03:12Ski Season May Be Closer Than You Think! Winter Snow Season is on its Way! Beat the Snow Season Crowds with The Ski Renter! Snow Season is Just Around the Corner! Winter is heading our way! Lake Tahoe has already had some snow and more is coming! This is a great time to beat the crowds and come in to The Ski Renter in Cupertino to set up a lease for the season. This is a first-come, first-serve basis and we do have a maximum, so come on in as soon as possible. Equipment will be due back in April and if you lease for your kids and they grow during the season (big surprise! ), come on in and we can refit them for boots and skis/snowboards to fit their growing bodies. Ready for the season to start? We are! Come on in and see us! /wp-content/uploads/2011/04/the-ski-renter.png 0 0 The Ski Renters /wp-content/uploads/2011/04/the-ski-renter.png The Ski Renters2017-10-23 19:06:332017-11-28 19:28:27Winter Snow Season is on its Way! Our slogan at The Ski Renter is “Think Snow!” Well, we thought snow, and snow we got! We have been tracking snowfall at Squaw Valley daily for the past thirteen years. (Hey, that’s what we do. It’s our business!) 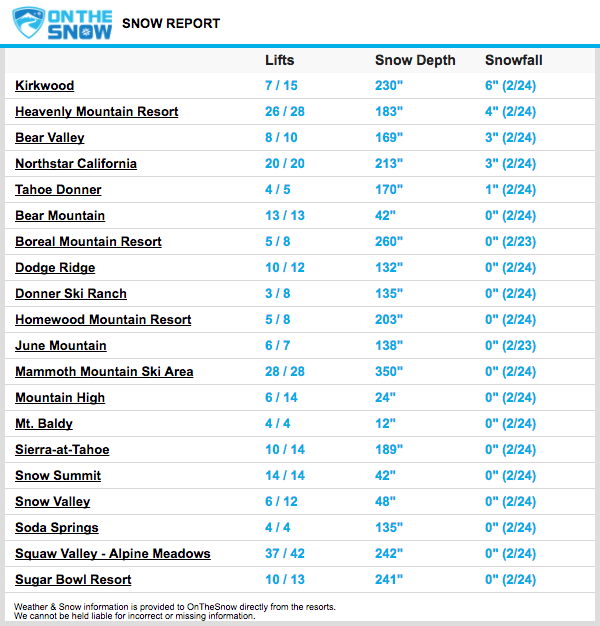 As of this writing, the base at Squaw is 138”, with 243” up on top. It’s been more snow on top of more snow this season. Total cumulative snowfall to date is 462”, which is the most we have had in over ten years. Temperatures have been a little warmer, so the snow has been wet, but now temperatures are dropping. We may get a few inches of snow over the weekend, but then there should be a break in the storms for an extended period of time. Lots of snow on the ground, clear skies, colder temperatures, and consequently, better skiing and boarding! https://theskirenters.com/wp-content/uploads/2017/03/header-feb22.png 439 1131 The Ski Renters /wp-content/uploads/2011/04/the-ski-renter.png The Ski Renters2017-02-25 00:43:252017-03-04 00:43:39More Snow! Get Outside With Family This Coming Thanksgiving Weekend! In case you haven’t heard: REI has decided to close all their stores for Black Friday (the day after Thanksgiving). Instead, they are encouraging their employees and clientele to get outside. We love that other retailers share our values! Thanksgiving Weekend is a time to be with your family and friends. We’ll be closed Thanksgiving Day, but we’ll be back in the store on Friday from 10am to 2pm, just in case you need anything. So get outside! Plan your first trip to the snow this season or camp where it’s still warm. Plan ahead by calling the The Ski Renter and reserve all the gear you need for your Thanksgiving adventures! https://theskirenters.com/wp-content/uploads/2016/03/unsplash-3.jpg 333 800 The Ski Renters /wp-content/uploads/2011/04/the-ski-renter.png The Ski Renters2015-11-03 00:45:292016-03-01 00:47:19Get Outside With Family This Coming Thanksgiving Weekend!